Andrew Tate doesn’t need an Ancestry DNA or 23andMe genetics test and analysis to know racing boats is in his DNA. His great-grandfather, grandfather, father, and mother all raced boats. Now, as a fourth-generation boat racer, you could say Tate was born to drive hydroplanes because it is in his blood. He began racing H1 Unlimited hydroplanes in 2016 where as a rookie he won his first winner-take-all final at the Albert Lee Appliance Cup in Seattle driving the U-9 Sound Propeller Service/Les Schwab Tire hydroplane. Three years into his young career, Tate has added three race victories and one non-point exhibition race win to the family’s trophy case. One is the prestigious President’s Cup that he won in 2017 near his home in Walled Lake, Michigan. With a strong season last year, including two fastest-qualifier poles, eight preliminary-heat wins, and his two winner-take-all finals, he just missed becoming the 2017 H1 Unlimited hydroplane national high points champion by 425 points, instead settling for second. Tate says his favorite thing about driving an H1 Unlimited hydroplane is “the fans, speed, prestige, the people involved in the sport and the sport’s history. He knows a little thing about the sport’s history. 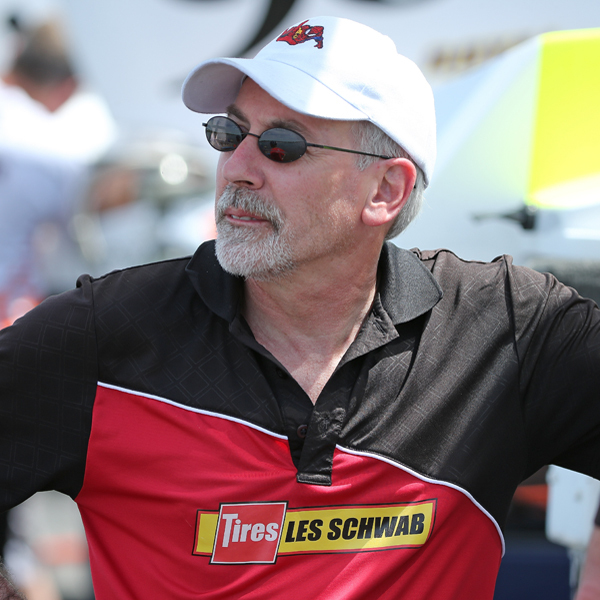 Andrew’s father, Mark Tate, who drove from 1990 to 2004, has 12 H1 Unlimited hydroplane victories including two American Power Boat Association Gold Cups and four H1 Unlimited national championships, and with son Andrew are one of only six other second-generation father-son combinations to race H1 Unlimited hydroplanes competitively. The duo join other father-son driver lineage that includes Greg Hopp (son) and Jerry Hopp (father), Mitch and Mark Evans (sons) and Norm Evans (father), Larry (son) and Norm Lauterbach (father), Roger and Tom D’Eath (sons) and Al D’Eath (father), Billy Sterett Jr. and Terry Sterett (sons) and Bill Sterett (father), and Wil Muncey (son) and Bill Muncey (father). 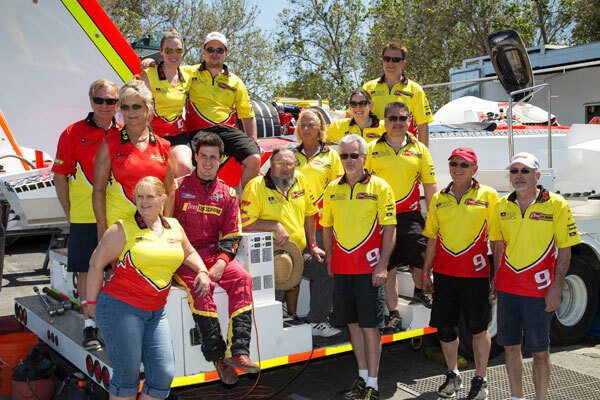 Although Andrew’s grandfather Joe Tate did drive an H1 Unlimited hydroplane in 1996 and drove a 7-litre powered hydroplane until he was 70-years-old, he never qualified as an H1 Unlimited driver. 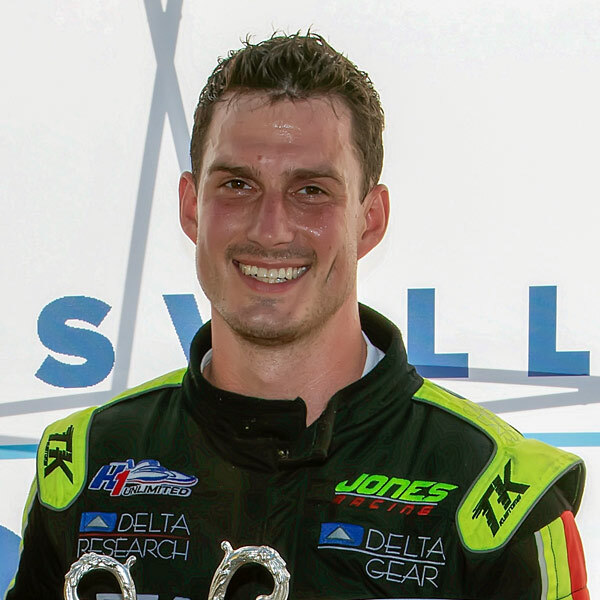 Like many of his H1 Unlimited hydroplane driving peers, Andrew began racing in the small wooden kneel-down outboard hydroplanes when he was just 9 years old. He graduated into the inboard hydroplane classes in 2006 and has since won nearly 100 races in various APBA hydroplane categories, including nine national championship titles, and has been inducted into the APBA’s Hall of Champions twice (2010 and 2016). Jones Racing’s biggest victory came in 2001 at the Detroit APBA Gold Cup racing for Tubby’s Grilled Submarine Sandwiches with Mike Hanson driving. In 2002, Hanson drove the team’s U-9 Sun Harbor Mortgage to a win at Bayfair in San Diego. 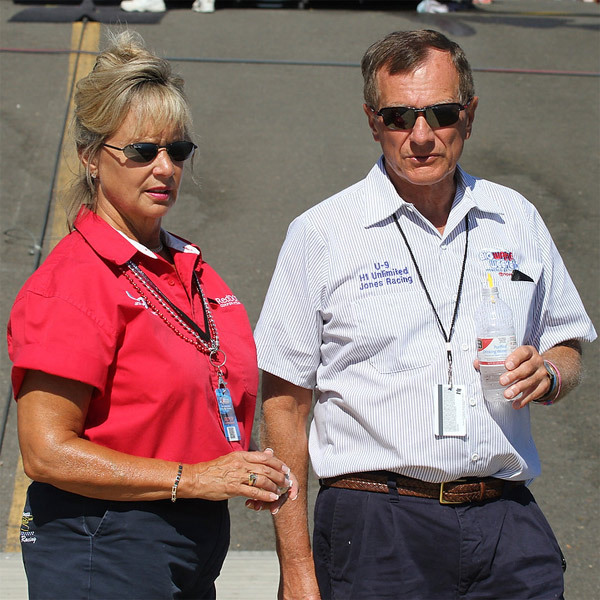 Since the 1950s, Mike Jones has competed in every category of APBA racing. He’s driven everything from A Stock Outboards to Limited Inboards to Unlimiteds and has served as Chairman of the UIM Offshore Commission. Mike qualified as an Unlimited hydroplane driver in 1993 when he shared the ride in the U-55 with Dr. Ken Muscatel. As the winning owner of the 2001 APBA Gold Cup, Mike Jones became the first sitting APBA President to win the APBA’s top award since Jonathon Wainwright in 1907. Jeff brings a wealth of knowledge and leadership experience to the U-9 team, including twelve years with the Miss Budweiser organization, were he served in a number of capacities including design and fabrication. Jeff’s racing career started at an early age, at only 14 he set his first world record in a limited hydroplane and would go onto set 3 records and win the 1985 national championship. His first unlimited experience would come helping his brother Mike work on the Miller American hydroplane team in 1987 which led to other unlimited teams like the US West Cellular, Frank Kenny Toyota and the 1988 Mr. Pringles team and others prior to joining the Miss Budweiser team in 1992 and continued until the team stopped racing in 2004. Jeff continued to hone his hydroplane skills by fabricating parts for other teams and building nearly 100 scale model race boats and is currently the president of the Electric Scale Unlimiteds club. In 2011 Jeff was called upon by owners Mike and Lori Jones, and Mike Hanson crew chief for the U-1 Miss Madison/Oh Boy! Oberto, to bring the 9 to Detroit as a last minute replacement for the Oberto race team, and was so impressed by how well Jon Zimmerman and the boat preformed that he decided to call upon some of his former Miss Budweiser team mates to run the team at the next two races. With the help of Dave Arnold and Mike McIntosh, the U-9 qualified in the top half of the field, besting a number of well financed teams and setting the stage for a major comeback in 2012 of the Jones Racing team. The Delta Companies including their Realtrac ERP Software firm are sponsoring the U-9 Unlimited for the 2016 UAW-GM Spirit of Detroit Hydrofest featuring the APBA Gold Cup Race on August 26th-28th. Delta Research and Delta Gear manufacture R&D, Prototype and Production gearing for the Automotive and Aerospace industries including complete transmissions for hybrid electric, gas / diesel powered passenger vehicle and the heavy truck transportation industry worldwide. Delta also produces drive system gearing for US Army’s tracked and wheeled vehicles, prototype and development gears for the US Armys new V-280 Valor Tilt Rotor Aircraft, including very complex 5 Axis machined components used on the US Navy’s new Electromagnetic Aircraft Launch System designed to catapult F/A-18 Fighter jets safer and faster on the newest aircraft carriers. 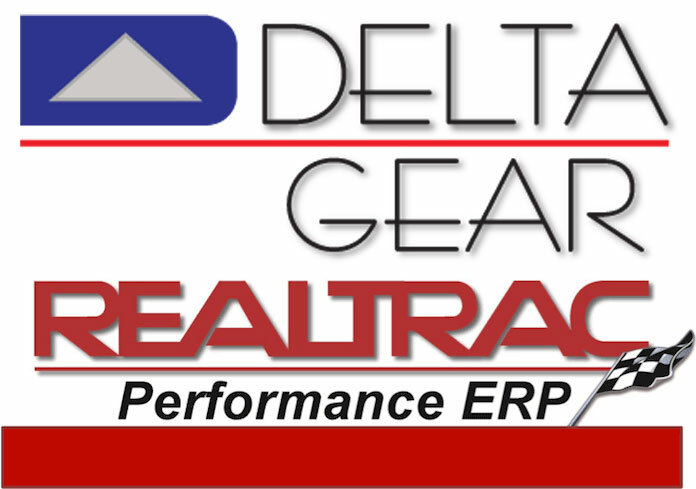 A third Delta company, Realtrac Performance ERP Software, specializes in manufacturing software for small to mid-size machine shops, job shops and make to order manufacturers. The company was founded in the heart of a machine shop and has served the manufacturing industry for over three decades. Realtrac is used by thousands of machining suppliers across North America. Boat Builder: Ron Jones, Jr.